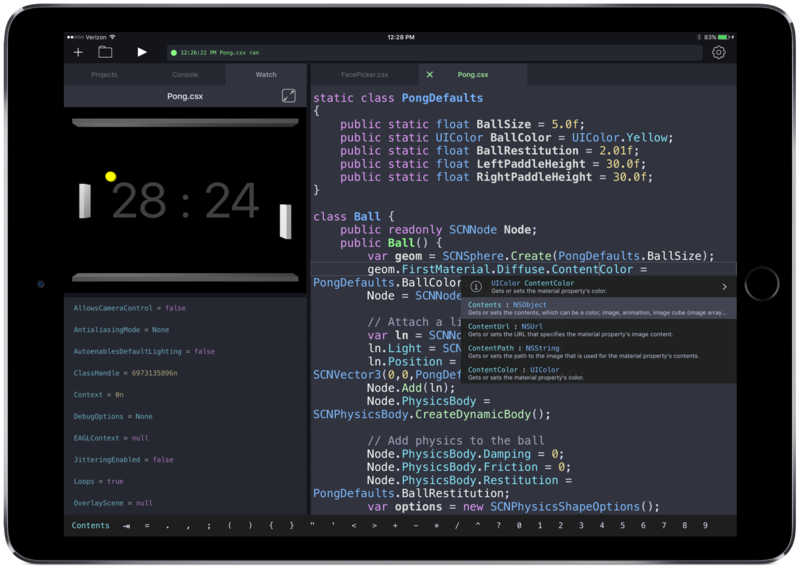 Professional C# and F# IDE for the iPad. Continuous is always running your code so you can see changes to objects as you type. This makes writing interactive applications easier than with the old Code-Build-Run cycle. You are now free to make lots of small changes and see their effects immediately. Having access to running objects as you code is like having an always-on debugger. You can inspect objects, create objects, and even call functions. Use whichever language you love or whichever is best at the task at hand - no judgement. No matter your choice, you will have beautiful semantic highlighting and code completion. All compiling is done right on the device. This keeps your code safe and secure and also ensures you'll never be bored on a flight again. Quickly find the right API or explore over 60,000 documented symbols. Quick access to keys needed by C# and F# programmers are always on screen so you don't have to toggle the keyboard very often. Writing scripts is fun, but eventually you need to split your code into multiple files. This is great for code reuse and for keeping your sanity. Continuous supports Application projects (Console and iOS) and Library projects in standard .csproj and .fsproj formats. Continuous comes with a variety of examples that range from boring forms apps to silly games. These are great if you're learning to program or just want to see some examples of the amazing things you can do on iPads. Copyright (c) 2016-2017 Krueger Systems, Inc.